Visit Kitt Peak National Observatory for an astronomer-guided stargazing exploration using telescopes, binoculars, and the naked eye. It will be a moonless night for maximum viewing. The University of Arizona is hosting this tour to highlight the billions of dollars invested in astronomical observatories across Arizona, making our state one of the world’s premier destinations for understanding our universe. The entire visitor’s center is reserved for this event, but space is limited to 60 attendees. Attendees will meet to ride a transport bus to Kitt Peak. Dress warmly! It will be surprisingly cold on top of the mountain. Wear comfortable shoes for walking and standing. A light box dinner will be provided. 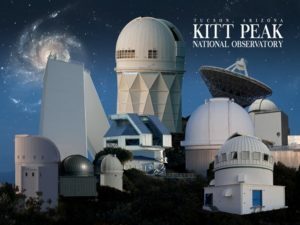 The Kitt Peak National Observatory (KPNO), located 55 miles west of Tucson, is the largest, most diverse gathering of astronomical instruments in the world for nighttime optical and infrared astronomy and daytime study of the Sun. KPNO is part of the National Optical Astronomy Observatory and shares the mountaintop site with the National Solar Observatory. KPNO operates three major nighttime telescopes and hosts the facilities of consortia which operate 22 optical telescopes and two radio telescopes. The Visitor Center operates three nighttime and three daytime solar viewing telescopes.